A comic-mad Hartlepool youngster who is recovering from cancer has been shortlisted in a competition to design a logo for organisers of the country’s biggest pop culture conventions. Ten-year-old Sam Dixon, who lives in Hart, is one of four finalists to design a video intro for MCM Comic Con, who stage conventions all over the country. Sam created his entry while receiving treatment in Newcastle’s RVI hospital after he was diagnosed with an aggressive form of leukaemia. He is currently in remission after receiving a bone marrow transplant which saw him spend nine months in hospital. Sam is currently leading the public vote on Twitter which closed at noon today. His mum Amy Dixon said: “Sam loves comic books and movies. He follows MCM on Twitter and noticed they were doing a competition to design a video logo. “I got an email on Friday to say he has bene selected for the Twitter vote. “If he wins he will get £500 and the logo will be used next year in all of their promotional material. Sam still has to travel to the RVI hospital two to three times a week for blood transfusions as a result of complications following his transplant in January last year. 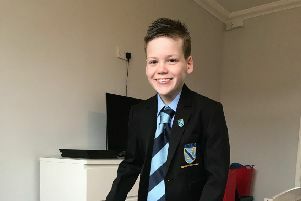 Amy added: “He lives a semi-isolated life where he is not allowed to go to school or mix with large groups of people because his immune system is still very weak. “The way he handles it is absolutely amazing. I’m so proud of him. “He immerses himself in a world of comic books and movies. Sam’s entry shows his hand colouring in the MCM Comic Con logo speeded up before spilled water makes the colours run. Background music is provided by Sam’s older brother Tony’s band Fuss. Sam is currently leading the Twitter vote after Bradley Lowery’s family shared it on Facebook. Sam and Bradley were friends when they were both in hospital together. To vote go to @MCMComicCon on Twitter.